COLUMBUS, Ohio — In rows of petri dishes, soybean roots bathe in fluorescent light, an unremarkable site unless you work in the laboratory where they grow. The simplicity of the setup belies the complexity of the research that went into creating the roots. For decades, the genes of the seeds that produced these roots have been tinkered with to create a plant that resists a common and highly destructive soybean disease: Phytophthora root and stem rot. Statewide, the disease accounts for $50 million in losses every year, ranking it as one of the top three most vexing soybean diseases for Ohio farmers. Phytophthora sojae thrives in wet, warm soil, particularly poorly draining soil, which is common in northwest Ohio. The soybean roots growing in Leah McHale’s lab at The Ohio State University just might have the genes to fend off the disease. The answer is at least two years away from being determined. In a month or so, the soybean roots will be exposed to Phytophthora, then watched to see whether they acquire the disease and die. If their resistance changes — getting better or worse — then that means McHale and her colleagues, including soybean pathologist Anne Dorrance, have identified another gene that affects resistance to Phytophthora. That gene then becomes a building block in creating a new variety of soybean seed that can thwart the disease. A soybean plant carrying that newly identified gene improving resistance will be crossed with another soybean plant with that same gene. Then the resulting seeds will be grown into plants and tested for their disease resistance. And that process will be repeated for a few more generations of plants grown throughout the state and at universities nationwide until McHale and other researchers can definitively say that the plant variety they created will not succumb to Phytophthora. The seed from those plants can then go to market for soybean growers in Ohio and elsewhere. The journey that begins in a petri dish and ends with a new variety of seed that resists Phytophthora can stretch to five or more years. That’s partly because a soybean has a surprisingly large number of genes, about 66,000 - roughly three times higher than the number of genes humans have. Soybeans are more complex than you might think. “You think plants, like soybeans, just sit there and grow, but they have to respond to sunlight, lack of rain, pathogens, insects, and other circumstances,” said McHale, an associate professor of soybean breeding and genetics in the College of Food, Agricultural, and Environmental Sciences (CFAES) at The Ohio State University. From 10 to hundreds of different genes are involved in resisting Phytophthora. Some genes have more of an influence than others in whether the plant succumbs to the disease. McHale and Dorrance help identify which combination of genes offers resistance to Phytophthora and create that combination in a single plant by crossing varieties of soybeans. In the simplest of breeding schemes, a resistant variety may be crossed with say a high-yielding variety, and the emergent plant is tested to see if it indeed offers desired disease resistance as well as high yields. The DNA of the resulting seeds are then analyzed to determine if they have the set of genes that can fight off the disease. Once that’s done, the seeds with the desired genes are allowed to self-pollinate for several generations, and then each resulting plant is tested to see if it can, in fact, fend off Phytophthora. As director of the Center for Soybean Research in CFAES and an international authority on soybean diseases, Dorrance tests the varieties of soybeans that McHale creates by exposing them to Phytophthora and seeing how they fare. If a plant survives the exposure, it’s closer to going to market for farmers to purchase. While CFAES researchers have long been studying Phytophthora and creating soybean seeds that resist it, the disease evolves. A variety of soybean that once resisted Phytophthora, can succumb to a newly-evolved version of the pathogen. So new varieties of soybean seeds are always needed. “We always have to try to keep one step ahead of the pathogen,” said Dorrance, who has worked for over a decade to identify the genes that contribute to Phytophthora disease resistance. Every year, Dorrance is called to fields devastated by Phytophthora. She knows well the signs, the characteristic root rot and brown discoloration at the base of the stem that moves up the stem, killing off the plant. After years of research, McHale and Dorrance, along with a team of soybean researchers, are in the final stages of locating which of the tens of thousands of genes in the soybean plant are responsible for resistance to Phytophthora. “We’ve done a lot to get to this point,” McHale said. As a result, McHale, her colleagues and their graduate student assistants can express and suppress genes that make up a soybean to see how that affects the soybean’s ability to resist the Phytophthora pathogen in the plant roots. The disease attacks the roots first and can infect leaves when infected soil particles are splashed or blown onto the leaves in a storm. 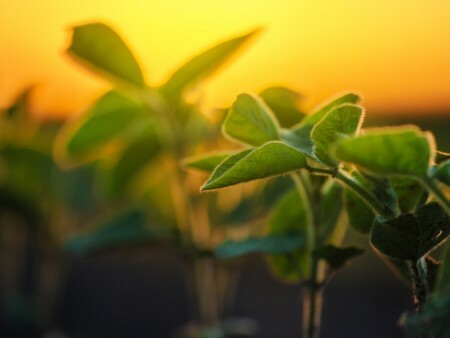 Even though researchers know the location of the soybean genes responsible for resistance, the trait for resistance has low heritability, meaning that the environment weighs heavily on whether the genes will be expressed or not, even if they are present in the plant. Across her desk, McHale spreads out sealed plastic bags, each containing a variety of soybeans. Some beans are larger than others, some are smoother and some have dark spots in the center, while others have a lighter spot or none at all. The majority are grown to be ground down and used for animal feed or turned into soybean oil, while some varieties are planted for human consumption in products such as tofu or soymilk. Along with creating new varieties of soybeans that survive various diseases, McHale and her team are developing seeds that offer other desired qualities including higher yields, protein, oil or sugar content, as well as a soybean that produces a firmer tofu. It’s impossible to gain all of those desired traits in one soybean seed, plus make the seed able to resist a number of diseases and offer high yields in any location where it is grown. That’s because thousands of genes are involved. “It’s never going to be a perfect seed,” McHale pointed out. And two factors are always changing: weather and pathogens. In 2015, Ohio State released five varieties of soybeans. This year, McHale said, the university expects to release two seed varieties, both of which will offer higher protein for production of foods such as tofu and soymilk.